Canon has introduced two new photo printers, the multi-function PIXMA MG5320 Wireless Photo All-In-One and the single-function PIXMA iP4920 Photo Inkjet Printer. Both are targeted to the small office and home markets. 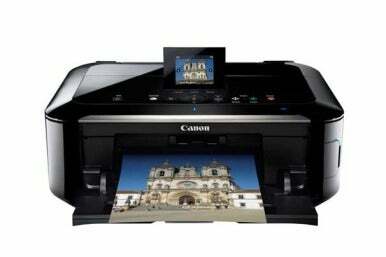 Both models also feature upgrades to Canon's Easy-PhotoPrint EX and Full HD Movie Print software. 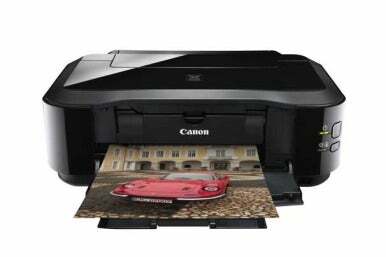 The Canon PIXMA MG5320 Wireless Photo All-In-One Printer, priced at $150, features five individual ink tanks (part of the ChromaLife100 plus ink system) and can produce a 4-by-6-inch borderless photo in approximately 20 seconds, the company says. The printer has a maximum color resolution of 9600-by-2400 dpi and delivers black and white prints at approximately 12.5 ppm (prints per minute) and color prints at approximately 9.3 ppm. This model provides an auto duplex printing function for paper conservation and a two-way paper feed that can help reduce the amount of time it takes to complete a project. The LCD panel has been repositioned and redesigned. It is now located toward the middle of the printer, while its size has increased to three inches. The $100 Canon PIXMA iP4920 Inkjet Photo Printer is a single-function model with the same ChromaLife100 + ink system as the MG5320. The unit can produce a 4-by 6-inch borderless photo in about 20 seconds. This new machine delivers black and white pages at approximately 12.5 ppm and color prints at approximately 9.3 ppm. The printer has a maximum color resolution of 9600-by-2400 dpi and features auto duplex printing. Canon has added Fun Filter Effects to its Easy-PhotoPrint EX software, similar in concept to scene modes found on the company's PowerShot digital camera line. You can customize images with Fish-Eye, Miniature, and Toy Camera effects. There is also an option to change the focus of the image to have it appear softer or to blur parts of the image's background. This line of PIXMA printers can also print directly to CDs, DVDs, and Blue-ray discs. Full HD Movie Print software has been enhanced to produce clearer images of frames from videos captured on compatible HD Canon EOS and PowerShot Digital Cameras. This technology allows users to merge multiple images into one final shot so they can capture nearly every portion of a particular action, such as a golfer’s swing or a baby’s first steps. Plus, a new layout feature allows users to print up to 72 individual images on one sheet of paper. For users who are registered with the Canon Image Gateway service or Picasa Web Albums, Canon is offering the PIXMA Cloud Link, which lets you print photos from photo albums stored in those services directly via the PIXMA MG5320 printer without a computer. PIXMA Cloud Link users also can access exclusive templates including stationary, envelopes, memos, calendars, and more. The PIXMA MG5320 printer is 802.11n Wi-Fi certified. Wireless networks can be set up with the press of one button when using a Wi-Fi Protected Setup (WPS), according to Canon. 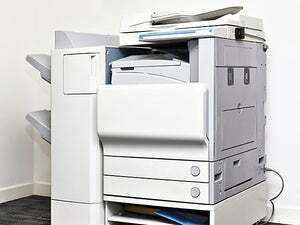 Wireless printing requires a working network with wireless 802.11 b/g or 802.11 n capability. Canon is offering service and support online for all all customers wanting to set up the new Wi-Fi printer. Customers get access to manuals and video tutorials to assist in setting up their Wi-Fi printer. The Canon EPP mobile app, for use with compatible iPhones and iPads, will be upgraded in August to allow documents scanned on the printer be sent directly to the mobile device. Users can also print PDFs of documents created with the app directly from compatible devices. Customers who purchased one of the new printers will also be offered exclusive printable content through Canon's Creative Park Premium. This content includes postcards, albums, and additional projects, including paintings by artists such as Norman Rockwell. The site offers free 3D paper craft projects, scrapbooking templates and embellishments, novel greeting cards, and educational materials. To access the Creative Park Premium, all of the software and the full set of genuine Canon inks that came with the printer must be properly installed. In addition, consumers who purchased the new printers will get the Canon Image Gateway, an online photography resource and service for owners of registered qualified Canon products. Those cusomers can upload and share up to 2GB of photos with friends and family. Members also can access photography articles on topics such as macro shooting, portrait photography, printing tips, and print projects to get the most out of their photos.